Happy New Year! Before we dive into today's recipe, I thought I'd follow the crowd a bit and tell you about some of the recipes I've posted this year, just in case you missed them! Another of my favorites because we eat it all the time is Fried Elvis Oatmeal, also one of my more popular posts. It's a quick way to use up extra bananas that doesn't involve adding a lot of sugar. Another terrific breakfast recipe that isn't as much work as you'd think are our Bagels - easy to make on a lazy Sunday morning when you have some time between your first cup of coffee and everyone getting up for breakfast. I hope you enjoy all the recipes we work on here at QTBO! Please poke around in our archives - there are lots of recipes to check out! 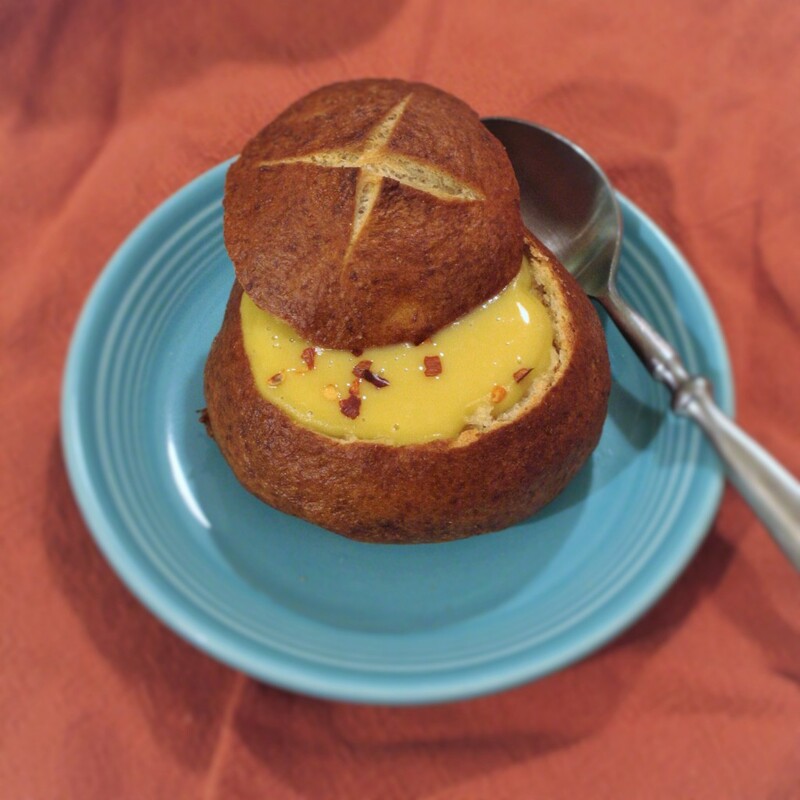 On this particularly frozen New Year's Eve, I decided that we needed a hearty soup in a bread bowl. 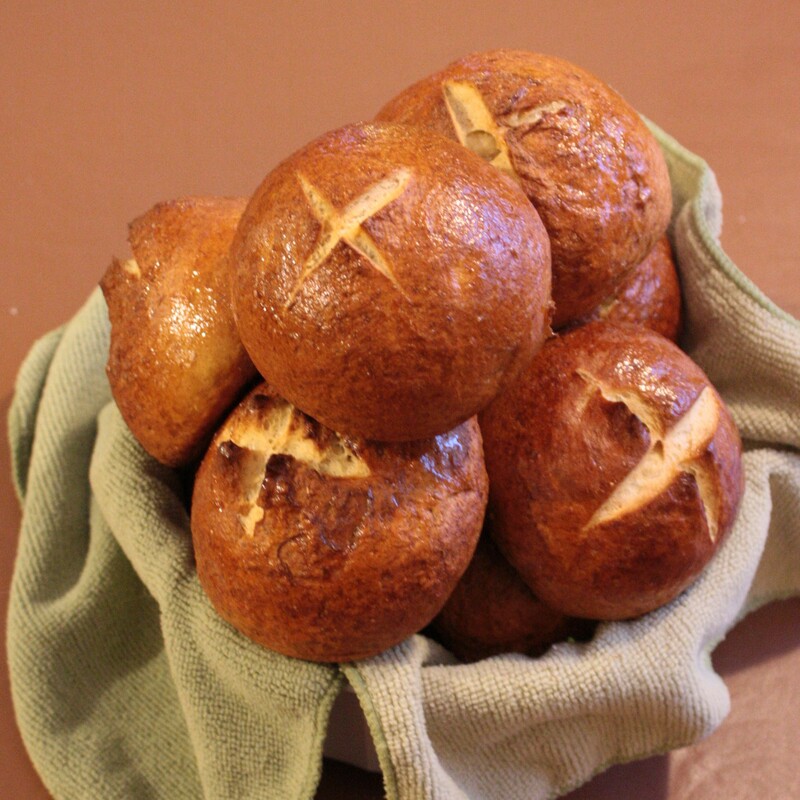 To that end, I made pretzel rolls that I adapted from this recipe on A Beautiful Mess. I wanted smallish bowls, so I made 10 out of the recipe instead of the suggested 6. Shape the dough into a ball, and put it in a bowl, covered with a damp towel, in a warm place (I put it inside my oven with the oven light on) for 1 hour, until it doubles in volume. 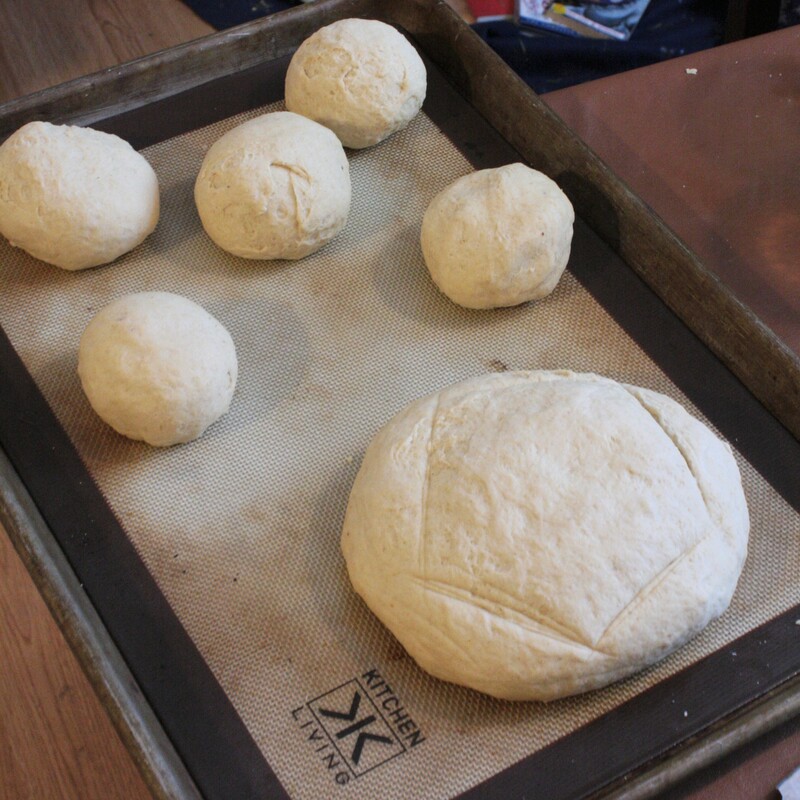 Punch down the dough and divide it in 10 parts like this: divide the dough in half, roll each half into a ball and flatten it. 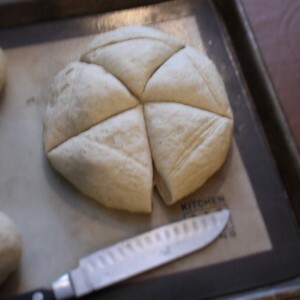 Mark a pentagram on each ball touching the sides (this is actually easier to do by sight than it is to divide a ball into 5 equal pieces - but if you want it to be exact, use a kitchen scale) Make a cut from each corner into the center of your dough, which divides each dough ball into 5 wedges. 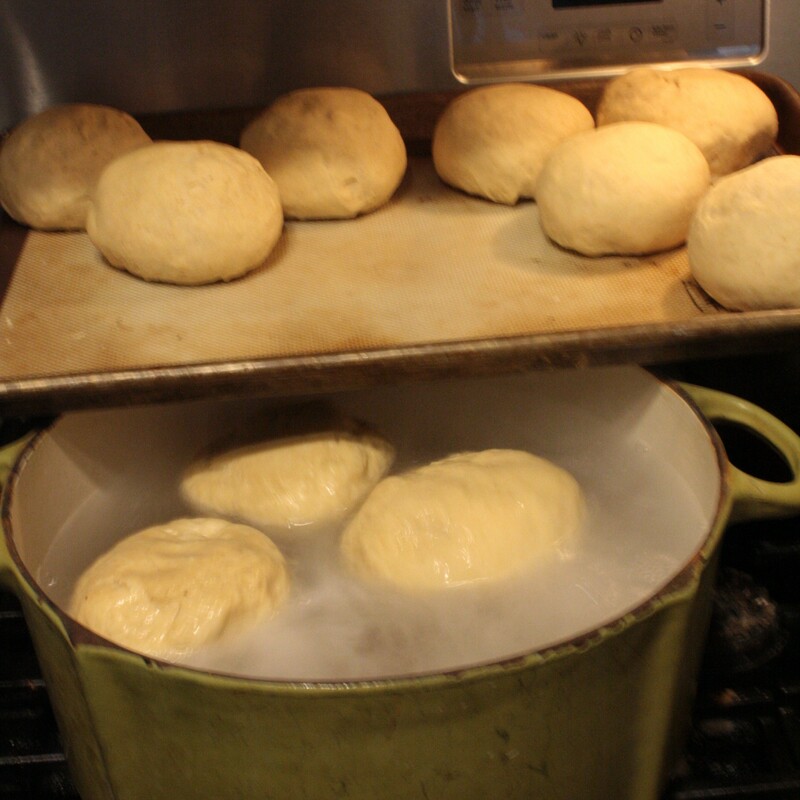 Bring a large pot of water (8-10 cups) to a boil and add the baking soda (for darker rolls, add a tablespoon of sugar as well.) 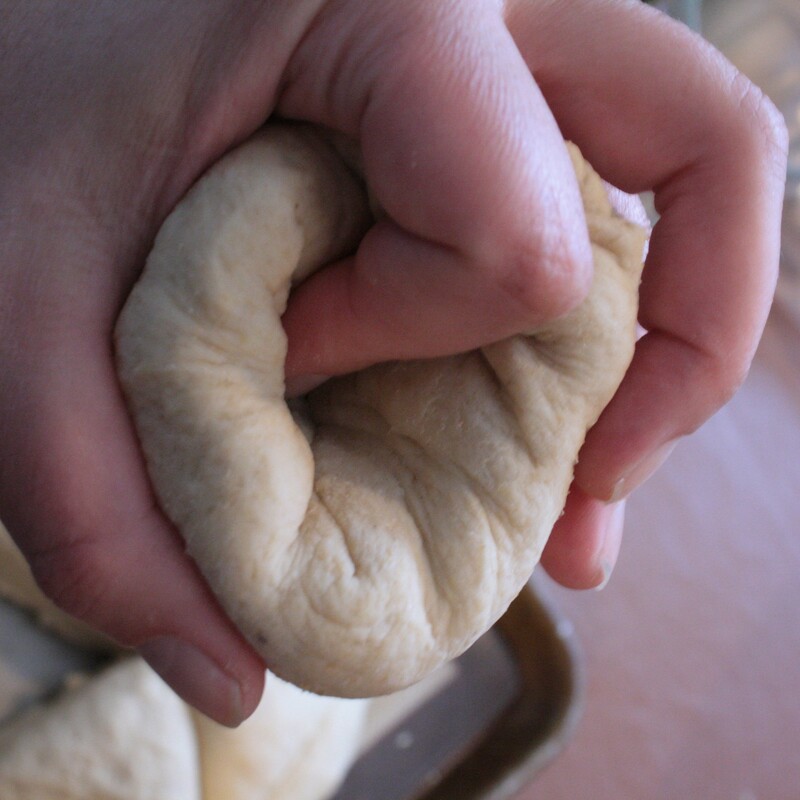 Once your rolls are done rising, drop them in the pot face-down, 3 or 4 at a time for about 20 seconds, then roll them over and leave them for 20 more seconds. Retrieve them with a spider or slotted spoon and put them back on the cookie sheet, seam-side down. Once all the rolls have had a bath, cut an x in the top of each roll and put the cookie sheet in the preheated oven for 20 minutes or until your rolls are dark brown and delicious-looking. While the rolls are still hot, brush with melted butter and sprinkle lightly with coarse salt. 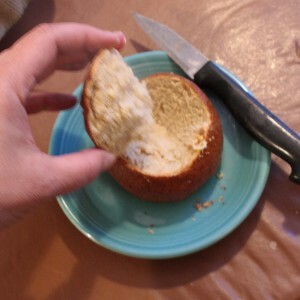 To make a bread bowl, cut a cone out of the top of each roll. Use your fingers to dig some of the bread out of the bowl and slice the top off the cone. Fill with soup and enjoy!